Apple has blamed "external physical damage" for causing a handful of iPhones to explode or catch fire in China and insisted that its handsets posed no safety problem. Fresh on the heels of Samsung's worldwide Galaxy Note 7 safety fiasco, a Shanghai consumer watchdog said last Friday it had received eight recent reports of iPhones that spontaneously combusted while being used or charged. In a statement to AFP late Tuesday, the US tech giant said it had retrieved units for analysis and conducted thorough tests on phones which had experienced "thermal events", but brushed off safety concerns. "The units we've analysed so far have clearly shown that external physical damage happened to them which led to the thermal event," the statement said. "We treat safety as a top priority and have found no cause for concern with these products." The company also denied being slow to respond, after the state-run Shanghai Consumer Council had urged it to address consumer complaints. 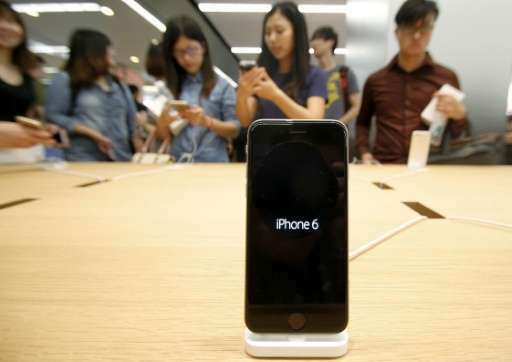 The council said it had received a sixfold surge in total complaints against Apple in the past two months, including sudden shutdowns of the iPhone 6 and 6s even though batteries still had enough power. The council did not say where the complaining iPhone users were located. Apple last month offered to change iPhone 6s batteries for Chinese users who complained of the sudden shutdowns, but said the problem did not constitute a safety issue. Samsung suffered a severe blow over its Galaxy Note 7's woes, recalling some 2.5 million units after reports of the product catching fire.